Rarely a day goes by when I’m not planning or at least thinking about my next trip to a Disney park. It’s the best way I have of distracting myself from the depressing fact that I’m not currently at a Disney park. I’ve been fortunate enough to visit Disney regularly for the past decade or so, and every single trip is special. Whether I’m venturing into Disney Springs just long enough to eat at Raglan Road or I’m spending an entire week in Walt’s original Magic Kingdom in Anaheim, I don’t take a minute of my time for granted. But even I know some Disney experiences happen only once in a lifetime. For me, some of these are things I have done and have chosen never to experience again, like a Dole Whip or a ride on Mickey’s Fun Wheel in the swinging death cars gondolas. Other experiences are ones I simply can’t relive because they left the earth forever after my first time, like Luigi’s Flying Tires (raise a glass) or The Enchanted Tiki Room: Under New Management (just raze it). Some Disney experiences are ones I consider to be “once in a lifetime” because I hope one day they will happen, but I never dream they really will. For me, Club 33 is one of those experiences. Or rather, it was. Due to some lucky, right-time-right-place circumstances that I won’t bore you with, Jeremy and I were given the opportunity to dine at Club 33 this past September. We shared our story on the podcast, but we never posted photos like we said we would. So now, seven months later, I’m finally putting some thoughts on record, not only so our listeners and readers can get a closer look, but also so I can relive that fun day once again through photos and good memories. Our lunch reservations were for noon on a rainy Thursday. If you know anything about Jeremy and me, you know we agonized a bit over what to wear. We had seen online that lunch attire was fairly relaxed, but still, we weren’t about to be the schlumpiest guys in the joint. In the end we settled on shorts and collared shirts, which, based on what others were wearing, seemed to be the right choice. Trying to time something perfectly while at a Disney park is very difficult. Do I have time for another attraction? How long will it take us to walk to the other side of the park? Because the last thing we wanted was to be late for our reservation, we ended up walking aimlessly around New Orleans Square for the better part of an hour, waiting for 12:00 to arrive. When it did, we slowly and nervously made our way to the unassuming bluish gray door and rang the doorbell. Have I made it clear enough how ill-suited and under-qualified we were to be entering an establishment like Club 33? I can’t overemphasize how unconfident and out-of-place we felt. But, to our surprise, someone on the other side of the door took our names and welcomed us inside a small courtyard. There we were given glasses of cucumber water and wet towels, which we pretended were perfectly ordinary starts to any meal and accepted as though we couldn’t imagine eating lunch without a few sips of cucumber water beforehand. After returning our glasses and towels, we took some photos in front of the famous staircase that used to be available to everyone as part of the Court of Angels but is now exclusively for Club 33 guests. Because of the rain, the hostess said it would be safer for us to take the elevator rather than the stairs, which we were more than happy to do since we wouldn’t have been able to see the inside of the elevator otherwise. Once we reached the lobby on the second floor, we were shown to our table, which was situated by a window in a dining room that was completely empty except for us. Because we were the only ones there, all attention was placed on us. A server immediately brought us a few menus, took our drink orders, and invited us to explore the room and the balconies while we waited. A second server (to whom I gave the name Lurch) stood nearby throughout our meal, always ready to remove a cleared plate or refill an empty glass. He rarely spoke a word or cracked a smile, but he made sure we were taken care of. In fact, after we had taken a few minutes to take in the view from the balcony, we retuned to find that Lurch had refolded the napkins we had left in our seats and had placed them on the table. Again, we acted as though this was totally normal and expected—just another typical lunch for Derek and Jeremy. Now, let’s get to the good stuff: the food. And when I say “good,” I mean some-of-the-best-I’ve-ever-tasted GOOD. To start, we were given a plate of bread. I failed to get a photo of the bread (Sorry! ), but it was a round loaf cut into slices all the way around. The consistency was much like angel food cake, but it was savory, moist, buttery, and oh so delicious. For our first course, we both unknowingly chose the same appetizer: Sautéed Asparagus with Black Truffle Brown Butter Vinaigrette and Fennel Coulis. Although everything I ate was beyond amazing, this was my favorite course. The white asparagus was perfection, and it paired so wonderfully with the coulis and other vegetables underneath. After Lurch promptly removed our clean plates, the second course followed. Jeremy received his cheese plate, while I was given a Salad of Frisée with Coastal Strawberries, Avocado, Pistachio, and Buttermilk Dressing. I love strawberries on my salad, but I’ve only ever had them on salads that were dressed with a vinaigrette. I was surprised by how much I enjoyed the combination of avocado, strawberries, and ranch. Course number two was another win. Besides cucumber water, over-attentive servers, and empty dining rooms, four-course meals are also something I’m unused too. I had long given up on the bread by this point, but I was still afraid I wouldn’t be able to finish all four courses. I have to say, though, that the portion sizes and timing between courses were perfect and made for a meal that was just the right amount of satisfying. Next we were given our entrées. Being a fan of seafood, I ordered the special of the day: Iron-Seared Swordfish and Royal Red Shrimp in a Sungold Tomato Broth. Jeremy opted for the Petite Filet Mignon, which was served with Haricot Verts and Cabernet Jus. We both enjoyed our entrées very much. My fish was cooked perfectly, and the broth really brought the whole thing together. For me, the hardest decision of the meal was which dessert to order. The sweet-toothed side of me wanted to order one of everything, but we were still putting on our “refined and cultured” act and this wasn’t Golden Corral. In the end I chose the monkey bread because it sounded playful and different, and I knew if anyone could master monkey bread it was Club 33. While I enjoyed the monkey bread thoroughly (it was very moist and had just the right amount of cinnamon-y syrup), I think I might have liked one of the other desserts better. By the time we had finished dessert, a few other parties had entered the dining room. But our own Club 33 experience was sadly coming to an end, so we took the opportunity to explore a bit more. First up: the bathroom. You’re not crazy. That is in fact a photo of urinals. That was one of the perks of visiting Club 33 on a slow day. We could take pictures at our own leisure without the fear of being judged (unless, of course, you’re silently judging me through the internet right now). Complimentary toiletries included floss picks, mouthwash, and something in that glass jar pictured on the far right. I can’t remember what was inside. Handkerchiefs maybe? Anyway, Jeremy and I both stealthily pocketed some Club 33-embroidered paper towels to keep as souvenirs. The bag the souvenirs came in was legit. I don’t think I could rip it if I tried, and the strap was thick rope. Club 33 leaves no detail overlooked. Our experience at Club 33 is something I will never forget. From the kindness we were shown to the gorgeous dining room to the incredible food, every minute was nothing short of perfect. The only thing I regret is that we couldn’t enjoy it as a Mad Chatter trio. If I’m ever lucky enough to go back, I hope Jeremy, Matt, and I can all dine together. We’ll eat as much angel food bread as we can stomach, we’ll toast Lurch and his unsettling watchfulness, we’ll gush about how exciting it is to be eating just above the greatest Disney attraction ever built, and we’ll give thanks for being able to dine in a place that holds so much history and is tied so closely to the man himself, Walt Disney. Until that day, I’ll just keep dreaming about that white asparagus. Woooo! Oh! Whoa! Ow! Wooooo… Oof! That’s the combination of sounds you’re likely to hear come out of my mouth while riding Space Mountain. You see, this “journey through space and time” is often a bumpy, jolting, unpredictable one. And I wouldn’t have it any other way. Why? Because when you’re at your happy place, your home away from home, you’re willing to put up with just about anything, even a bit of physical discomfort. I realized this recently when having a Twitter conversation with a fellow Disney fan over on the west coast. He was raving about Disneyland’s Space Mountain, saying it’s much better than the original in Orlando. I confessed to him that I found Disneyland’s version to be, well… boring. It has no sudden drops or fast turns. Instead, it lifts you up a long hill then spends the rest of the time slowly guiding you back to the bottom. It’s essentially a long slide. Is it smooth? Absolutely! But to me, it’s missing a certain element of thrill. I guess I was expecting what was promised by official Disneyland promo pictures like this one. In response, the Disneylander said that Florida’s Space Mountain, to Disneyland regulars, is kind of like what the Matterhorn is to Disney World fans: rough and uncomfortable. And then it clicked. He was absolutely right. 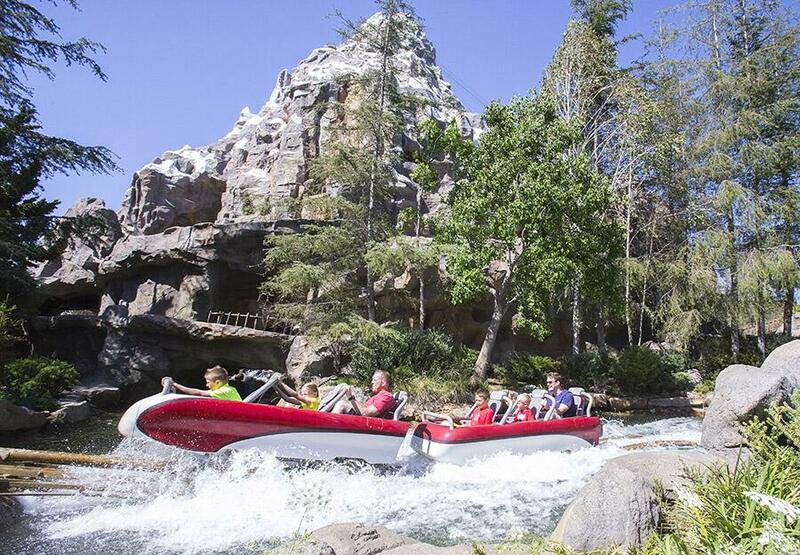 The Matterhorn at Disneyland is perhaps the first and only Disney attraction I have opted not to re-ride simply because of the pain it inflicts. The seats are uncomfortable, the leg room is virtually non-existent, and the damage it did to my elbows and thighs was not something I wanted to experience again. But to a Disneyland regular, it’s the Matterhorn! It’s a classic! How can you not love it? And that’s exactly how I feel about Space Mountain at Disney World. Does Walt Disney World have its share of uncomfortable rides? Sure! 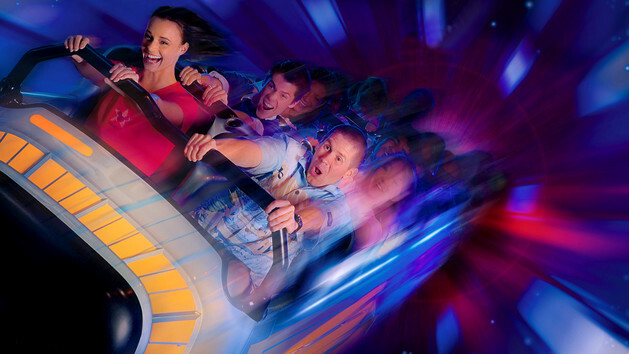 I know people who can’t stand Space Mountain because of its roughness. Okay, I can’t put any sort of positive spin on that one. 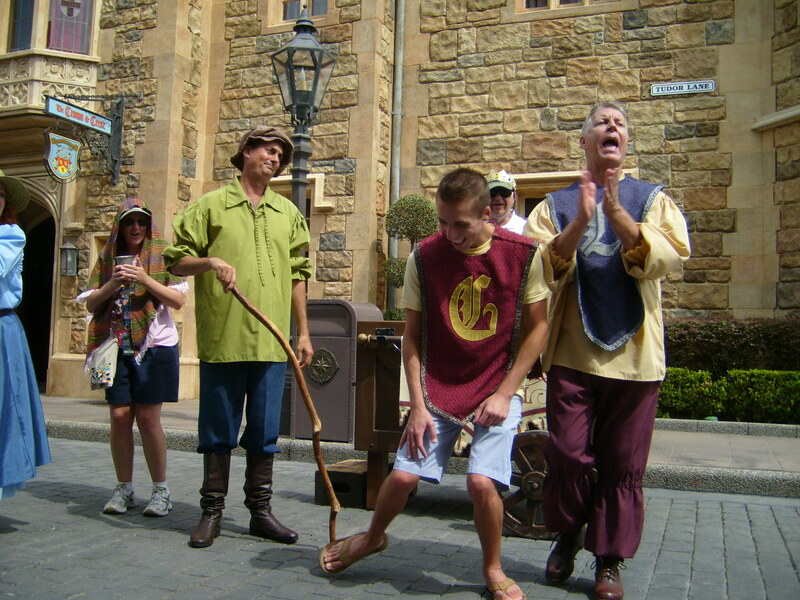 Even The World Showcase Players, the former comedy troupe in the U.K. Pavilion, caused me immense discomfort when they volunteered me to be part of their performance, but hey, it made for great pictures and a fun memory. Who knows, maybe in time I’ll even learn to love the Matterhorn as well. You’ll just have to force me on it first.